Mike Leigh completed his second feature film seventeen years after his stunning debut with Bleak Moments in 1971. In those intervening years he solidified his reputation with innovatory theatre and television productions, but his ambition to be a film-maker looked in danger of being unfulfilled. Other directors, including Stephen Frears , retreated into television during this period, but Leigh was additionally hampered by his method of evolving a script through improvisational workshops - too uncertain a process for most film financiers. 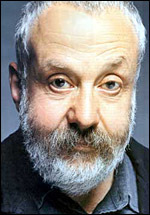 Mike Leigh was born in Salford on 20 February 1943, the son of a doctor, and was educated at Salford Grammar School before gaining a scholarship to the Royal Academy of Dramatic Art in 1960. This was followed by spells at Camberwell School of Arts and Crafts , the Central School of Art and Design , and the London Film School . In 1965 he started to devise and direct his own plays, completing nine before the production of Bleak Moments at the Open Space Theatre in 1970. Bleak Moments became the basis for Leigh's first film, a seemingly simple tale about a woman ( Anne Raitt ) who looks after her mentally disabled sister in suburban south London. Struggling towards meaningful social contact, she has a desultory friendship with another woman from work and embarks on a fumbling relationship with an emotionally stunted teacher ( Eric Allan ). But audience expectations are constantly undercut, and the portrayal of individuals adrift among social forces they are ill-equipped to handle, an aspect that came to characterise Leigh's work, is edgy and uncomfortable. In the years between Bleak Moments and High Hopes (1988), his next fully-fledged cinema film, Leigh made nine feature-length television plays (one of which, Meantime , was given a limited theatrical release), as well as shorts and theatrical productions. Leigh encouraged actors to go beyond the naturalistic in their characterisations; desperate situations, masked by humour, are caught unflinchingly by dramatic lighting and an often static, but precisely positioned camera. The best-known of these television plays is Abigail's Party (BBC tx 1/11/1977), a quickly taped studio reconstruction of one of Leigh's most successful stage works. Despite the fact that it was conceived for the stage rather than television, it became a comedic tour-de-force that impinged on the English national psyche. Beverly, the woman played by Leigh's then wife Alison Steadman , is a kind of character who recurs in various guises throughout Leigh's work - a person who adopts the trappings of what they regard as a sophisticated lifestyle with an over-confidence and lack of taste that serve to emphasise their empty existence. It takes them into a cultural vacuum which both mirrors and masks a personal despair. In 1988 Film Four and British Screen agreed to back Leigh in a second theatrical feature. The resulting film, High Hopes , centres on a disjointed working-class family. Cyril is in a loving relationship with his long-time girlfriend Shirley in a run-down flat in King's Cross. His sister has followed the upwardly mobile path to unhappiness, emptiness and appalling taste with her aggressive entrepreneurial husband. Their mother lives in a council house marooned among gentrifying neighbours. Within this framework Leigh explores many interconnecting themes, not least the possibility of having children, an issue that threatens to divide many Leigh couples. Through Cyril's frustrations at the futility of his socialist beliefs and his struggle to keep bitterness at bay, Leigh comments sharply on the changes in British society and re-endorses the importance of humanist over materialist values. Much of the family drama was familiar to people from Leigh's television work; but a renewed visual confidence appeared in scenes like the explosive family argument at the elderly mother's surprise birthday party where the camera focuses hard on Edna Doré's expressive face as voices are raised in anger around her. The film's critical acclaim and relative commercial success, plus the support of producer Simon Channing-Williams , joint founder of Thin Man Films in 1989, established Leigh as a major British film director. International renown steadily increased with his three subsequent films - Life is Sweet (1990), Naked (1993), and Secrets & Lies (1996), all made with backing from Channel 4 . Although Leigh has been accused of patronising his characters and encouraging the audience to look down and snigger at their antics, most of them, despite their eccentricities, are ordinary individuals courageously struggling with limited resources to confront life's problems. Brenda Blethyn's Cynthia in Secrets & Lies - an unmarried woman who endures a boring factory job, lives unhappily with a daughter who regards her with sullen resentment, and is dependent for survival on her more successful brother - faces life's injustices with enterprise and humanity. It is one of Leigh's greatest strengths that his films recognise and celebrate the heroism of seemingly insignificant characters as they try to overcome their limitations, express themselves, and do the right thing. The character quirks of speech, gesture, and appearance encouraged in his actors - what Leigh terms a 'running condition' - sometimes inspires acting that plays too close to the surface and distracts the viewer from the film's action, as with Jane Horrocks in Life Is Sweet and Katrin Cartlidge in the flashback sequences of Career Girls . But these characters remain flesh and blood, and are never merely caricatures, monsters or victims. Leigh's films demand second (or more) viewing, after which things usually fall into place and what initially appeared irritating can subsequently seem extraordinary. Career Girls , especially, is a film that grows in stature as time passes. The flashbacks, acting more as the essence of memory rather than accurate depiction of the past, yield a contrast which helps define the characters and plot changes in social realities between the two eras. In Naked , David Thewlis's performance was regarded as controversial less for its stylistic quirks than the character's unrelenting misogyny. We first see him attacking a woman at night in Manchester, and then follow him to London on a journey that becomes a picaresque cruise through other peoples' vulnerabilities. Thewlis makes his character, Johnny, an articulate misanthropist. He acts with a breathtaking disregard for people's feelings, but the fact that he remains unshakeably committed to his own view of the world allows even this despicable character a sort of heroism. If Naked revealed Leigh as bold enough to disregard political correctness and allow his characters unfettered freedom of expression, Topsy-Turvy , his study of Gilbert and Sullivan , showed him flexible enough to adapt his usual method of working to create a unique costume drama built around well-known historical personages. Leigh takes his time - a leisurely 160 minutes - and breaks all the rules about character arcs and plot structure. Gilbert's eccentric father, sisters and mother appear unannounced and disappear as unexpectedly; long sequences of rehearsal and performance break up the narrative. But this enhances rather than diminishes the film. Leigh's fascination with the process of artistic creation, and his willingness to give his supporting cast the space to develop as rounded characters, moves the film beyond a conventional film biography. Jim Broadbent's Gilbert and Alan Corduner's Sullivan are charismatically convincing, but Leigh's real achievement is in setting their lives and work among a vividly depicted array of performers, lovers, servants, wives and the paraphernalia of backstage life. Gilbert, Sullivan and their collaborators were the epitome of Victorian optimism, but like most of the characters in most of Leigh's films, they are shown to be troubled, flawed, and deeply human, the dying fall of the film's ending capturing the melancholy as well as the exuberance of artistic performance. All or Nothing - set like all his cinema films in London - marked a return to small-scale family drama. Over time Leigh has built up a pool of actors, constantly refreshed, on which he can draw with confidence. In All or Nothing , regulars Timothy Spall , Lesley Manville , Ruth Sheen and Marion Bailey join talented newcomers Alison Garland and James Corden as struggling working-class people facing huge emotional crises. The depth of characterisation achieved is typical of Leigh's deeply compassionate and thoughtful films, and is equally evident in Vera Drake , which is set in 1950 and focuses on a cheery working class woman housewife who helps women rid themselves of unwanted pregnancies at a time when abortion was illegal. Despite its low budget, clever casting (Vera is played with uncanny conviction by Imelda Staunton , but as in Topsy-Turvy all the characters surrounding her come dramatically to life), and an unerring sense of the grim austerity of post-war Britain make it one of Leigh's most satisfying films, confirming his status as a major film-maker.